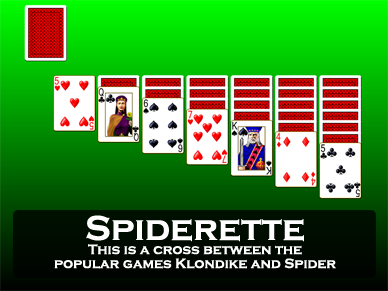 Screen shot of the game Spiderette (similar to Long Tail) from Pretty Good Solitaire. Long Tail is a variation of the classic game Spiderette, a one deck Spider type game. At the start of the game, one card is dealt to each of five tableau piles. Two cards are dealt to a special reserve pile (called the Long Tail). The remaining cards form a stock. As with most Spider type games, there are no foundation piles. The objective is to build four sequences of 13 cards down in suit from King to Ace in the tableau. When such a sequence is created, the cards will be moved out of play, giving you an empty tableau pile to use for the remaining cards. 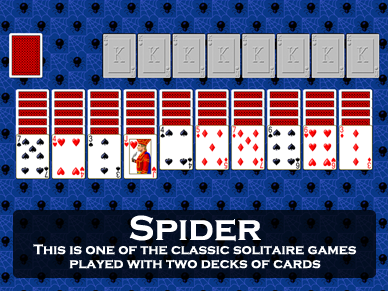 The tableau piles are built down regardless of suit, while groups of cards can only be moved if they are in sequence down by suit (this is just like Spider). Any card or legal group of cards can fill a space. 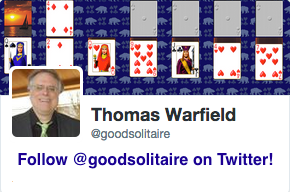 Furthermore, you can play any card or legal group of cards to the reserve long tail pile. Remember, of course, that any cards played to the long tail will need to be extracted from it sometime in the future. Only the top card (or a sequence of cards down in suit) can be moved from the long tail. When you have played all the moves you want to make, clicking on the stock pile will deal one card to each tableau pile (as in Spider). Then you make more moves in the tableau to try to put the cards into sequences. As in Spider, you want to favor in suit sequences over all others. The long tail can be used both as a storage location and as a cell (like in FreeCell). It can be helpful to concentrate on getting one suit sequence built, since the sequence is then removed, leaving more room to build the remaining sequences. It is likely that Long Tail can be won every time, although currently the average score is about 33%. 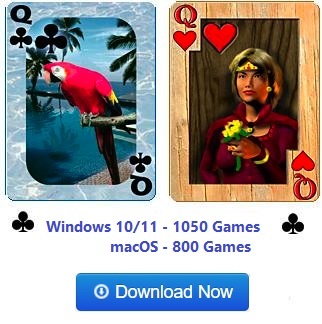 Spiderette is one of the 850 games in Pretty Good Solitaire.